Old Bollywood movie poster of the hit Hindi film Shaan (1980) for sale. Featured here for sale is an old Bollywood poster of the 1980 classic Hindi film which featured the greatest superstar of Indian cinema, Amitabh Bachchan in the lead role. Printed and circulated several years after the first release of the film (somewhere in the late 1980s / early 1990s), this Shaan movie poster was designed for publicity of a subsequent release of the film but never ended up being used. This old Amitabh poster features a quirky hand drawn design. 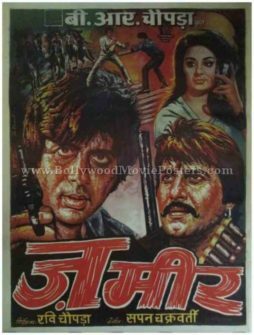 Amitabh Bachchan is seen holding a gun along with Shashi Kapoor on the top of this Shaan movie poster. The title of the film appears in Devanagari Hindi font on the top. A smaller photographic still of Bollywood's infamous villain Kulbhushan Kharbanda (who played the memorable character of Shakaal in the film) is seen below. 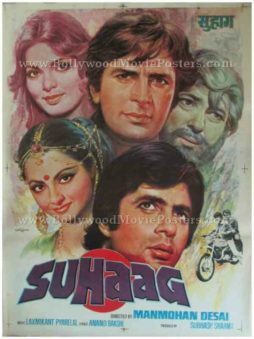 Large quirky hand painted renditions of Amitabh Bachchan, Sunil Dutt, Shashi Kapoor and Shatrughan Sinha are seen at the bottom of this Shaan movie poster. Interestingly, all of them are seen holding guns. Shaan is a 1980 blockbuster Hindi film directed by Ramesh Sippy (director of the epic film Sholay). Despite having an amazing star cast, the film failed to match the success of Sholay (1975). RD Burman's music in the film however ensured that the film became a commercial success. Songs like “Yamma Yamma”, “Pyar Karne Waale” & “Jaanu Meri Jaan” went on to become a rage throughout the nation and are still played today. Featured here for sale is a reissue Bollywood poster of the 1980 classic Hindi film which featured the greatest superstar of Indian cinema, Amitabh Bachchan in the lead role. Printed and circulated several years after the first release of the film (somewhere in the late 1990s / early 2000s), this Shaan poster was designed for publicity of a local re-release of the film but never ended up being used. This old Amitabh poster features two photographic stills of the superstar. 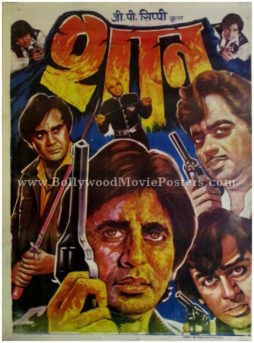 Amitabh Bachchan is seen holding a gun along with Shashi Kapoor on the top and again on the center of this Shaan poster. 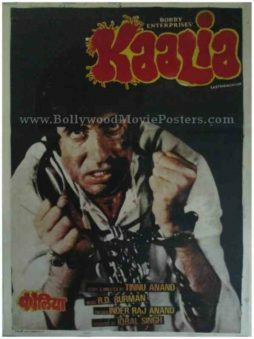 Smaller photographic stills of supporting actor Shatrughan Sinha and Bollywood’s infamous villain Kulbhushan Kharbanda (who played the memorable character of Shakaal in the film) are seen on the bottom of this Shaan poster. Shaan is a 1980 blockbuster Hindi film directed by Ramesh Sippy (director of the epic film Sholay). Despite having an amazing star cast, the film failed to match the success of Sholay (1975). RD Burman’s music in the film however ensured that the film became a commercial success. Old Bollywood poster of the blockbuster Hindi film Sharaabi (1984) for sale. This is an actual surviving old Amitabh movie poster of the 1984 film that featured the greatest superstar of Indian cinema in the lead role. Pran, Om Prakash, Ranjeet, Suresh Oberoi and Jaya Prada played supporting roles in the film. Printed and circulated a few years after the first release of the film (somewhere in the late 1980s / early 1990s), this Amitabh Bachchan movie poster was originally designed for publicity of the film but never ended up being used. This old Amitabh Bachchan movie poster was originally designed on canvas in hand painted format by a small time art studio in Delhi. 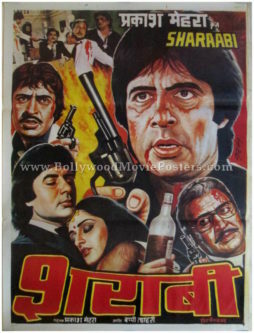 A large hand drawn close up of superstar Amitabh Bachchan holding a pistol is seen prominently in this Sharaabi poster. A smaller rendition of the superstar embracing actress Jaya Prada while holding a bottle of whiskey (typifying his character as an alcoholic in the film) is seen at the bottom of this Sharaabi film poster. The typography used in this poster is both in English as well as Hindi. Smaller hand painted renditions of Pran and Ranjeet both holding pistols are also seen in this old Sharaabi movie poster. Sharaabi (Drunkard) is a 1984 Hindi film produced and directed by Prakash Mehra. This was Prakash Mehra’s last hit and sixth in a row with superstar Amitabh Bachchan, the other five being Zanjeer, Hera Pheri, Muqaddar Ka Sikandar, Laawaris and Namak Halaal. The movie stars Amitabh Bachchan, Jaya Prada, Pran, Om Prakash and Ranjeet. The film’s blockbuster music was composed by Bappi Lahiri, for which he bagged several awards. Sharaabi became a silver jubilee “Blockbuster” at the box office and went on to be another mega hit of superstar Amitabh Bachchan. This was also one of Amitabh’s last films before he temporarily gave up acting to venture into politics. Songs like “Inteha Ho Gayi Intezaar Ki” sung by Kishore Kumar & Asha Bhosle and “De De Pyaar De” by Kishore Kumar became a rage and continue to be played till today. 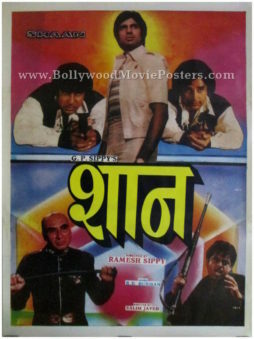 Old Amitabh movie poster of the super hit Hindi film Shahenshah (1988) for sale. 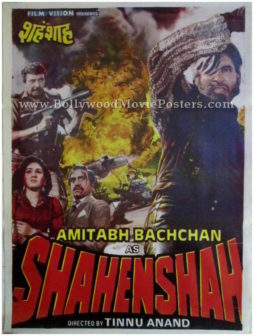 This is an actual surviving Amitabh Bachchan movie poster of the super hit classic Shahenshah that featured the angry young man of Indian cinema in a superhero avatar. Meenakshi Seshadri, Amrish Puri, Pran, Kader Khan and Rohini Hattangadi played supporting roles in the film. Printed and circulated a few years after the first release of the film (somewhere in the 1990s), this old Shahenshah movie poster was originally designed for publicity of the film but never ended up being used. The greatest superstar of Indian cinema, Amitabh Bachchan is seen in his iconic superhero avatar prominently on one side of this Shahenshah poster. Smaller photographic stills of Meenakshi Seshadri, Amrish Puri and Pran are also seen in this old Shahenshah movie poster. Amitabh Bachchan old movie poster of the cult Hindi film, Agneepath (1990) for sale. This is an actual surviving old Amitabh movie poster of the 1990 cult film that featured the greatest superstar of Indian cinema in the lead role. 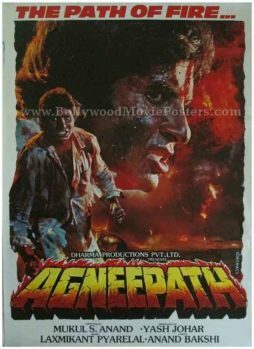 Amitabh Bachchan and Mithun Chakraborty received the National Film Award for Best Actor and Filmfare Best Supporting Actor Award respectively for their performances in this action drama, making this Agneepath movie poster highly collectible! Printed and circulated a few years after the first release of the film (mid 1990s), this Agneepath movie poster was originally designed for publicity of the film but never ended up being used. This Agneepath 1990 poster has been designed by master calendar artist JP Singhal and bears a signature in the name of his studio, “Singhal’s” on the bottom right hand corner. Agneepath is a 1990 action packed Bollywood movie starring Amitabh Bachchan in the lead role as “Godfather” Vijay Deenanath Chauhan and Danny Denzongpa as the villain, Kancha Cheena. The film’s initial failure at the box office was attributed largely to Amitabh Bachchan’s experimentation with his voice, which many believed to be inspired by Marlon Brando’s style of speaking in The Godfather. The cult success of the film led Karan Johar to remake the film in 2012 with the same title as a tribute to his father Yash Johar (who produced the original 1990 flick). The film was also remade in Tamil as Sivasakthi, starring Sathyaraj and Prabhu Ganesan directed by Suresh Krissna. 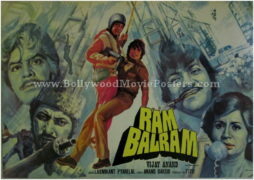 Highly collectible old Bollywood cinema showcards of the hit Hindi film Ram Balram (1980) for sale. This is an actual surviving set of six old Bollywood cinema showcards of the 1980 film that featured two of the biggest superstars in Indian cinema of the time, Amitabh Bachchan and Dharmendra. Printed and circulated somewhere during the original first release of the film, this fabulous set of old Bollywood cinema showcards was originally designed for publicity of the film inside a theater. Showcards were used as pin ups on notice boards inside foyers of cinema halls. Printed on photo paper, they are mounted on cardboard to make them easy to display. This rare surviving set of old Bollywood cinema showcards was actually issued to a cinema hall that screened the film Ram Balram, making it highly collectible! This stunning set comprises six individual showcards, originally designed on canvas boards in hand painted format by the greatest and highest paid Bollywood movie poster artist of all time, Diwakar Karkare (owner of Studio Diwakar), further adding to its desirability and collectible quotient. Artist Diwakar Karkare’s signature style and mastery over the paint brush is evident in the captivating artwork of these old Bollywood cinema showcards. Credited with designing most of Amitabh Bachchan’s old movies posters, Diwakar paints Amitabh’s face flawlessly using two different textures – one a more rugged and macho portrait in an action packed setting; and a second more softer style to capture him in his romantic best opposite Rekha in this stunning rare picture painted showcard. Villains Ajit, Amjad Khan and Prem Chopra are seen in stunning portraits on one of the showcards as well. Ram Balram was released at the time when Amitabh Bachchan and Rekha’s rumored secret affair had received widespread publicity. In the following year, the cult romantic classic Silsila was released, making it the last film to feature Rekha opposite Amitabh Bachchan. 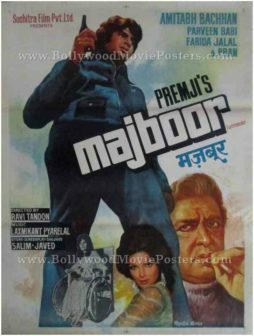 Old Amitabh movie poster for sale of the hit Hindi film Majboor (1974). This is an actual surviving vintage Bollywood poster for sale of the 1974 crime drama that starred the greatest superstar in Indian cinema, Amitabh Bachchan in the lead role. Printed and circulated during the first release of the film (mid 1970s), this old Amitabh movie poster was designed for publicity of the film but never ended up being used. This old Amitabh movie poster was originally designed in hand painted oil on canvas format by leading Bollywood poster painter Shrikant and bears his printed signature on the bottom right hand corner. Superstar Amitabh Bachchan is brilliantly captured in a stunning full length hand painted portrait in this vintage Bollywood poster. Smaller hand painted portraits of Pran (seen smoking a cigarette) and Parveen Babi appear at the bottom of this old Amitabh movie poster. A black and white still photograph of Farida Jalal on a wheelchair is seen copy pasted at the bottom. Majboor was a remake of an American film called Zig Zag (1970). Directed by Ravi Tandon, the film was written by the greatest screenplay writer duo of Bollywood, Salim-Javed. The movie starred Amitabh Bachchan, Parveen Babi, Pran and Farida Jalal in prominent roles. 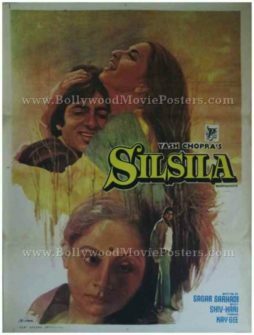 Old Bollywood movie poster for sale of the cult Hindi film romance, Silsila (1981). 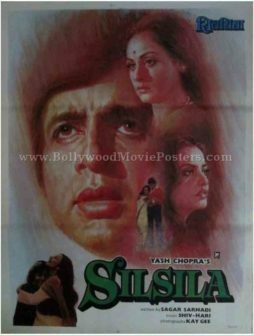 This is an actual surviving old Amitabh movie poster of Silsila, which is regarded as one of the most romantic films ever made in Bollywood. Printed and circulated a few years after the first release of the film (late 1980s), this massive six sheet Silsila poster was originally designed for publicity of the film but never ended up being used. This massive Amitabh Bachchan old movie poster was originally designed in hand painted oil on canvas format by noted Bollywood poster painter Yashwant and bears his printed signature on the bottom left hand corner. The complicated love triangle of Amitabh, Jaya and Rekha is brilliantly captured in hand painted brush strokes in this stunning six sheet movie poster. A large portrait of superstar Amitabh Bachchan is seen prominently in the center. Solo portraits of Jaya and Rekha are seen in opposite ends of the poster. Amitabh and Rekha appear in a passionate embrace towards the right of this massive six sheet Bollywood poster. A smaller still image of Rekha and Amitabh taken from a smash hit song from the film is seen on the bottom left corner of this old movie poster. Silsila is a 1981 Hindi film directed by Bollywood’s king of romance, Yash Chopra. The film stars angry young man Amitabh Bachchan alongside his wife (both in real life as well as the film) Jaya Bhaduri Bachchan. Rekha plays the role of Amitabh’s extra-marital love interest. It is widely regarded that the script of the film was derived from reality – i.e. the film was loosely inspired by the alleged real life love triangle of Amitabh-Jaya-Rekha (an affair which received massive publicity during the release of the film). Silsila was the the last film to feature Rekha opposite Amitabh Bachchan, putting an end to their rumored secret affair, forever. Over the years, Silsila has gained a strong cult following and is considered as one of the greatest love triangles in Bollywood. The film is remembered for the powerful and everlasting performances of all of its leading characters. Songs from the film, particularly “Dekha Ek Khwab,” “Yeh Kahaan Aa Gaye Hum,” “Neela Aasman” and “Rang Barse” (sung by Amitabh Bachchan himself) are fondly remembered and played till today. Very rare vintage six sheet poster of one of the greatest Bollywood movies ever made, Deewaar (1975) for sale. This is an actual surviving old Bollywood movie poster of the 1975 action Hindi film that featured the biggest superstar of Indian cinema, Amitabh Bachchan in the lead role. Deewaar (sometimes also spelled as Deewar) is considered one of the most iconic movies ever made in Indian cinema and finds mention among the cult films of Bollywood, making this very rare six sheet poster highly collectible! Printed and circulated a few years after the first release of Deewaar (somewhere in the early 1980s), this Amitabh Bachchan old movie poster was intended for publicity of the film but never ended up being used. The Deewaar old movie poster was originally designed by over painting a collage of still photographs by noted Bollywood poster artist C. Bakshi. His printed signature is seen on the bottom left corner of this Amitabh Bachchan movie poster. In this Deewaar Amitabh poster, poster artist C. Bakshi has used an iconic still photograph of Amitabh Bachchan prominently on the left. 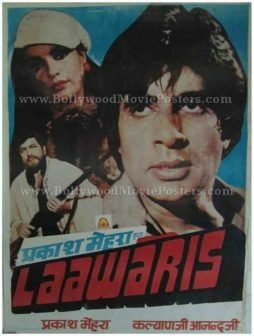 Smaller still photos of Shashi Kapoor, Madan Puri, Parveen Babi, Neetu Singh & Nirupa Roy are also seen in this six sheet Deewaar poster. One of them, Shashi Kapoor chooses the path of good, becoming a police officer. Amitabh on the other hand turns into a mafia don and amasses quick wealth and success. This creates an obvious divide or enmity between them, inspiring the title of the film. Deewaar is believed to be based loosely on the real life of one of Mumbai's iconic gangsters, Haji Mastan. For preparation of his character as a gangster in the film, it is further believed that Amitabh Bachchan met Haji Mastan in person to study his mannerisms. Amitabh Bachchan old movie poster of the cult Hindi film Silsila (1981) for sale. This is an actual surviving Amitabh Bachchan old movie poster of what is regarded as one of the most romantic films ever made in Bollywood. Printed and circulated a few years after the first release of the film (late 1980s), this Silsila poster was originally designed for publicity of the film but never ended up being used. This Amitabh Bachchan old movie poster was originally designed in hand painted oil on canvas format by Bollywood poster painter Yashwant and bears his printed signature on the bottom right hand corner. The complicated love triangle of Amitabh, Jaya and Rekha is brilliantly captured in hand painted brush strokes in this old movie poster. A large portrait of superstar Amitabh Bachchan is seen prominently in the center. Intersecting faces of Jaya and Rekha in opposite directions are seen overlapping Amitabh’s portrait. Visible diagonal brush strokes add synergy to the overall design and make the three juxtaposed portraits appear seamless. 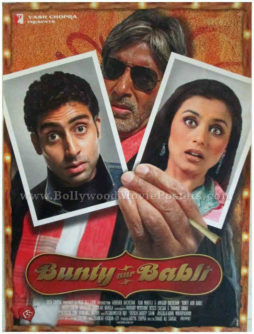 Two key photographic stills from a hit song in the film are seen pasted in the center and below in this Amitabh Bachchan old movie poster for sale. 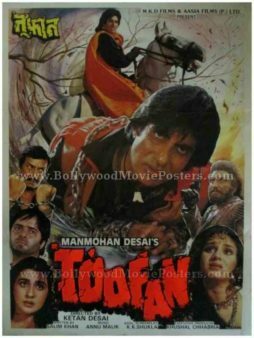 Old Amitabh Bachchan movie poster of the superhero action Hindi film, Toofan (1989) for sale. This is an actual surviving old Bollywood movie poster of the 1989 film that starred the biggest superstar of Indian cinema, Amitabh Bachchan in a memorable double role (one as superhero “Toofan” and the other as a magician). Printed and circulated during the first release of the film (somewhere in the late 1980s), this old Amitabh movie poster was originally designed for publicity of the film but never ended up being used. Toofan was produced by Manmohan Desai and directed by his son Ketan Desai. Amitabh Bachchan plays a superhero action figure in the film, using a crossbrow as a weapon. This old Amitabh movie poster was originally designed by creating a collage of key photographic stills on a board by leading Bollywood poster designer Chandrakant of Studio Chandrakant fame. The typography and background elements are hand painted. Beautiful retro still photographs of lead actors Amitabh Bachchan, Amrita Singh, Meenakshi Seshadri, Pran, Goga Kapoor and Farooq Sheikh are seen in this old Bollywood poster. The original angry young man of Bollywood, Amitabh Bachchan is seen in the avatar of a caped crusader riding a horse in this old Bollywood movie poster. Old Amitabh Bachchan movie poster of the memorable Hindi film, Jaadugar (1989) for sale. This is an actual surviving old Bollywood movie poster of the 1989 film that starred the biggest superstar of Indian cinema, Amitabh Bachchan in the lead role. Jaadugar marks the final collaboration between Prakash Mehra and Amitabh Bachchan (previous movies being Zanjeer, Khoon Pasina, Hera Pheri, Muqaddar Ka Sikander, Laawaris, Namak Halal and Sharaabi). Jaadugar was the last Prakash Mehra film to star superstar Amitabh Bachchan, making this old Amitabh poster, highly collectible. This old Amitabh movie poster was originally designed by creating a collage of key photographic stills on a board. The typography and background elements are hand painted. Beautiful retro still photographs of lead actors Amitabh Bachchan, Amrita Singh, Jaya Prada and Aditya Pancholi are seen in this old Bollywood poster. The original angry young man of Bollywood, Amitabh Bachchan is seen in the avatar of a Godman in this old Bollywood movie poster. Old Amitabh Bachchan movie poster of the hit Hindi film, Zameer (1975) for sale. This is an actual surviving old Bollywood movie poster of the 1975 film that starred the biggest superstar of Indian cinema, Amitabh Bachchan in the lead role. This old Amitabh movie poster was originally designed in hand painted format using oil paints on canvas by a small time art studio in Delhi, giving it a very quirky appearance. 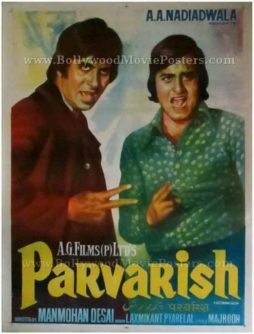 Quirky hand drawn portraits of the lead actors Amitabh Bachchan, Vinod Khanna and Saira Banu are seen in this old Bollywood poster. The original angry young man of Bollywood, Amitabh Bachchan is seen holding a pistol in his hand. Zameer is a 1975 Bollywood action drama produced by B.R. Chopra for B.R. Films. It stars Amitabh Bachchan, Saira Banu, Shammi Kapoor, Madan Puri and Vinod Khanna. Songs from the film, particularly “Tum Bhi Chalo Hum Bhi Chale” are fondly remembered and played till today. The film was released during the unforgettable year of 1975 at a time when blockbusters like Deewaar, Sholay, Dharmatma and Julie had hit the screens. Old Amitabh movie poster of the cult Hindi film Silsila (1981) for sale. This is an actual surviving Amitabh Bachchan old movie poster of what is regarded as one of the most romantic films ever made in Bollywood. Printed and circulated a few years after the first release of the film (early 1980s), this Silsila movie poster was originally designed for publicity of the film but never ended up being used. This old Amitabh movie poster was originally designed in hand painted oil on canvas format by the greatest and highest paid Bollywood movie poster artist of all time, Diwakar Karkare, making it highly collectible. 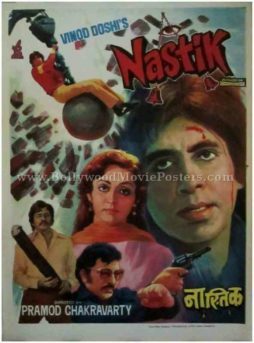 The original signature of Bollywood poster artist Diwakar Karkare is seen on the bottom left corner of this old Amitabh movie poster. Old Amitabh movie poster of the blockbuster Bollywood romance, Kabhi Kabhie – Love is Life (1976) for sale. This is an actual surviving old Bollywood movie poster of the 1976 Hindi film produced and directed by the king of Bollywood romance, Yash Chopra. Kabhi Kabhie featured Amitabh Bachchan, the greatest superstar of Indian cinema in the lead role opposite Raakhee. Printed and circulated a few years after the first release of the film (somewhere in the late 1970s), this Amitabh Bachchan old movies poster was printed for publicity of the film but never ended up being used. This old Amitabh movie poster was originally designed by cutting out images of actors from separate still photographs (shot on set location) and pasting them on a board. The poster depicts the lead couples in various romantic poses with typography being entirely in English. 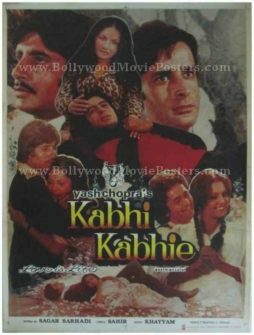 Kabhi Kabhie (Sometimes) is a 1976 Bollywood romantic film produced and directed by Yash Chopra. The film had an impressive cast, which included Amitabh Bachchan and Shashi Kapoor. This was Yash Chopra’s second film with the two actors playing lead roles after the unforgettable classic, Deewaar. The film won several Filmfare awards for its music, and its songs are considered as the greatest ever made in Bollywood. Tracks from the film such as “Kabhi Kabhie Mere Dil Mein” are played till today. The film also led to the reinvention of Amitabh Bachchan as a romantic hero – a breakaway from his erstwhile avatar as the angry young man of Indian cinema. The film also featured a poem recital by Amitabh Bachchan which acted as a prelude to the smash hit title song “Kabhi Kabhi Mere Dil Mein.” It is said that this recital paved the way for Amitabh to take up singing entire songs in his subsequent films. 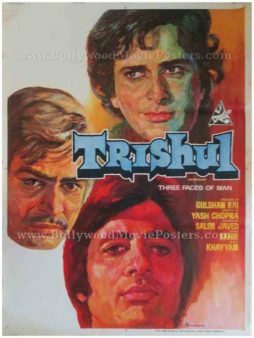 Old Bollywood movie poster of the super hit Hindi film, Trishul (1978) for sale. This is an actual surviving vintage Bollywood movie poster of the 1978 film that starred the greatest superstar of Indian cinema, Amitabh Bachchan in the lead role. Printed and circulated during the first release of the film (somewhere in the late 1970s), this Amitabh Bachchan old movie poster was originally designed for publicity of the film but never ended up being used. This old Amitabh movie poster features stunning hand painted artwork created by one of the highest paid and most sought after Bollywood poster designers of his time, Diwakar Karkare of Studio Diwakar fame. A stunning hand painted portrait of the “Angry Young Man of Bollywood,” Amitabh Bachchan is seen at the bottom. True to his style he uses in most Amitabh Bachchan movie posters, Bollywood poster artist Diwakar Karkare paints Amitabh’s face in a fiery shade of red, signifying anger. Superbly painted portraits of the other lead actors Shashi Kapoor and Sanjeev Kumar are seen on the top and center respectively of this old Amitabh movie poster. Originally hand painted on canvas by master Bollywood poster painter Diwakar Karkare, this Amitabh Bachchan old movie poster bears his printed signature on the bottom right. Trishul (1978) is a super hit Bollywood movie directed by Yash Chopra starring the greatest superstar of Indian cinema, Amitabh Bachchan. The film’s script was written by the hit writer duo Salim-Javed, and music composed by ace music director Khayyam. The film’s success at the box office prompted a subsequent remake in Tamil by Rajnikanth. Old Amitabh movie poster of the cult Hindi film, Agneepath (1990) for sale. This is an actual surviving old Bollywood poster of the 1990 cult film that featured the greatest superstar of Indian cinema, Amitabh Bachchan in the lead role. Amitabh Bachchan and Mithun Chakraborty received the National Film Award for Best Actor and Filmfare Best Supporting Actor Award respectively for their performances in this action drama, making this Amitabh Bachchan old movies poster highly collectible! Printed and circulated a few years after the first release of the film (early 1990s), this Amitabh Bachchan movie poster was originally designed for publicity of the film but never ended up being used. This Amitabh Bachchan movie poster has been designed by master calendar artist JP Singhal and bears a signature in the name of his studio, “Singhal’s” on the bottom right hand corner.